The gastric bypass is classified as a restrictive and malabsorptive surgery. 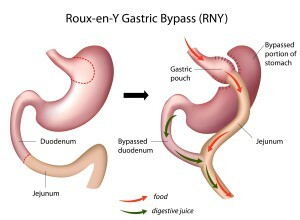 The Roux-en-Y Gastric Bypass is the current “gold standard” weight reduction surgery. It is the operation in which all other bariatric surgeries are compared. The surgery is performed laparoscopically wherein the upper part of the stomach is stapled-off to create a small gastric pouch. A portion of the small bowel, the jejunum, is divided and attached to the small stomach pouch. The other small bowel end is joined back to the small bowel. With this re-routing, the remainder of the stomach and the top end of the small intestine (duodenum) are bypassed. This operation has higher long-term rate of Type 2 Diabetes remission than restrictive procedures. A recent meta-analysis study reported an overall remission rate of 78% among diabetic patients undergoing bariatric surgery. Minimally Invasive Surgery- small incisions, less pain, early ambulation and return to work. Very good for rapid remission and long term control of Type 2 Diabetes. Usual weight loss- 60-70% of excess weight in 1-2 years.